The OG Climbers are one of the most casual pants Outlier makes, and are made with active use in mind. The “OG” refers to the original material Outlier used in their pants — it’s the cloth which they founded the company on. OG cloth is insanely stretchy with a decent drape to it, resulting in a very comfortable, but casual look. They feel thick, but when wearing them they are not overly warm as the fabric is breathable. They have a very soft feel to the inside, while the outside feels like a soft shell jacket. The Climbers are hard to describe because they can look “nice” from far away, but more casual the closer you get (particularly in Bluetint Gray) The Charcoal or Black would look a little dressier — but the give away is the pockets and seams — all of which are very noticeable. The Climbers are all about stretch. I actually took my kids to the “world’s largest bounce house” and spent an hour with them in it — the Climbers never once restricted movement in that crazy environment. This is why they are easily the most comfortable pants I own. I like these, but if you don’t like the look in the pictures, you won’t like them in person. These are not core pants for me, they aren’t the pants I would choose if I could only choose one pair. However, if I can get away with wearing them, I wear them. They feel like a cheat code — they aren’t sweat pants or warm ups, they look better than that — but they are most certainly more comfortable than those pants. These are the longest pants I’ve ordered from Outlier, making them a good option if you find other Outlier pants too short for you. However I found them hard to wear at all before I hemmed them. If you are one to just cuff pants to avoid a simple hemming visit at the tailors, then be warned: that won’t work with these pants. One of my biggest concerns with these pants was durability — the facing of the fabric, combined with the stretch gave me some pause when putting them through more abrasive moments. Having slid on the knees and gone down several make shift slides with my kids in that bounce house — I fully expected to see some pilling of the material in the knees. However, my fears have thus far not been warranted as the pants still look brand new. These seem to be just as durable as my other Outlier pants while being much more stretchy and soft. If you notice the front pockets in the images, they have what Outlier calls a leaf pocket design. 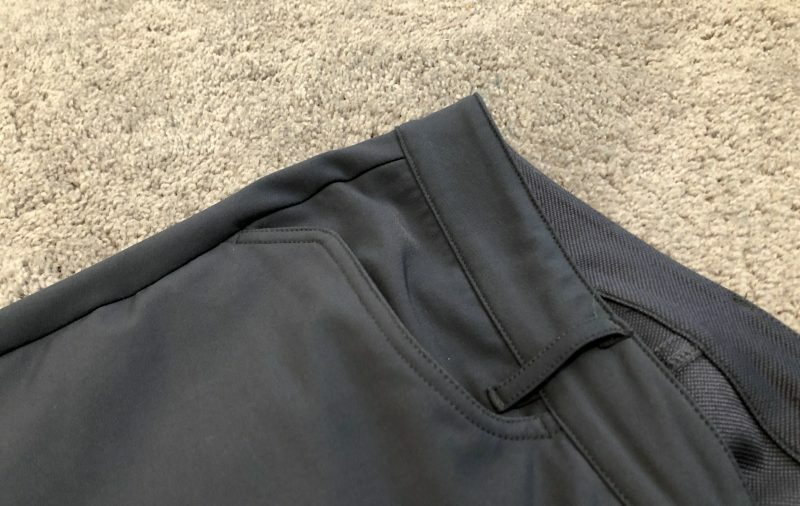 These pockets have almost a tab on the outside edge rather than connecting right to the side seam. It’s distinct and one of the design cues which makes these pants far more casual. It’s also an acquired taste and one of the reasons I don’t often wear these pants outside my house. Pockets generally pop out like this when wearing them. 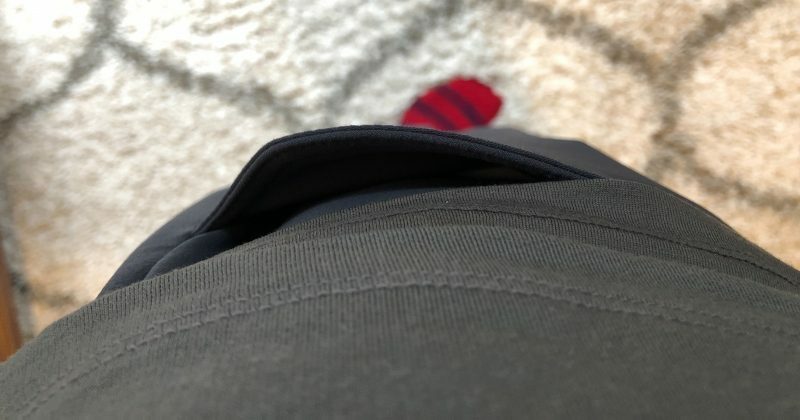 The leaf pockets are great for easily getting your hands in and out of the pockets, but I find that they tend to stick out a bit from the pants when you are standing. This is what allows your hands to slide into the pockets with ease, but it also gives an odd look to the pants. Also, if you like to clip things to the top of your pockets, then you’ll be unhappy as they don’t play well with clipping pocket knives and such. Overall, I don’t love the look of these pockets, but for a lounging pant they are a non-issue. For wearing out and about, I find the pockets to be the biggest deal breaker. As with most Outlier pants, these are DWR treated and water and muck rolls off them. Dust, fine dry dust, does not roll off them. It’s even hard to wipe dust off with a wet cloth. After a day at a local farm with kids events, the bottom of my Climbers were so dusty that even wiping them clean didn’t help. They had to be washed. That’s an odd property for a pair of pants made to be worn outside for active uses, and something I’ve yet to see in my other Outlier pants. I can only imagine this would be exaggerated on darker colors. I would hike in these, as they do a fantastic job of allowing you to move while still regulating your body temp. I do find they need more regular washing as dust settles in, and they tend to stretch out quite a bit (but a good wash brings them back to form). These pants have fully replaced my warm ups and sweat pants — they are what I wear when I want to lounge or otherwise be exceedingly comfortable. It’s a bonus that they look a bit nicer than any other options which are this comfortable.